The art of playing cards is as a result of ideas and refinements that resulted within the first 1200 years AD. It can be traced back in China, during the 9th century AD when a princess Tongchang played the leaf game. Later, it was then introduced in Europe during the last quarter of the 14th century. At the time, the Europeans spoke of a Moorish or Saracen game called naib that contained a deck of 52 cards. Later in the 1430s, the Italians invented the tarot deck that comprised painted images that acted as trumps. The card game remains popular in various regions of Central Europe. Card games have since evolved with images and symbols changing in every phase. Today, the most common deck is the 52-card Anglo-American deck for playing games such as the contract bridge and poker. It has a card for every combination of 13 ranks and four French suits- the club, the spade, diamond and the heart. The ranks comprise numbers ten to two and the king, queen, ace and jack. Today, playing cards has become more of a commercial activity than a hobby. More casinos have been set up to gratify the increasing demand for gamers to play cards in the form of poker and other card game variants. The next text provides an in-depth overview on how to deal and play poker. It is the process of bringing the cards together in a pack in a random order. The cards should be shuffled before each hand. This way, players won’t know where the cards are located. The rule of thumb states there should be four riffle shuffles accompanied by a cut before dealing a hand. The dealer may ask the player to his right to cut the deck and place the cards from the bottom. The fairness of a game is determined by how well cards are dealt. Inexperienced dealers may reveal cards without their knowledge. Professionals have, however, mastered the skill of dealing cards fast without revealing them. The dealer deals two hole cards in a clockwise or anti-clockwise direction. He may follow the American or the European style of dealing the cards. The American style involves placing the card facing downwards and sliding it towards the player. For the European style, the dealer slides the top card to the player with a spin. The dealers should continue dealing the cards until all the players have a number of cards to play. The dealer also manages the pot. As such, if a player says $50, the dealer should ensure the player bets this amount of chip, and all the other callers match up. The player on the left of the blind (big) starts off the pre-flop action while the first player seated on the left of the dealer button starts the post-flop action. The player with the highest hand is awarded the chips to the player. 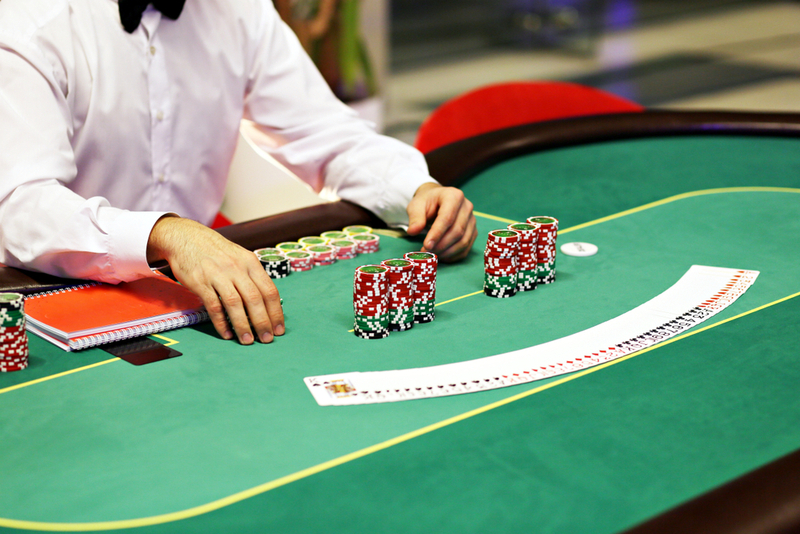 In case of a tie, the dealer splits the pot among the winning players. The players are dealt with two hole cards facing downwards. This stage of the game is called the pre-flop as whatever action (bet, check or fold) the player makes depends on the hole cards or the starting hand. When all the players have placed a bet, the dealer places three shared cards in the middle of the table facing upwards. The dealer then places a fourth shared card (the turn) as players place more bets. A final round of betting is made, and the dealer adds a fifth card known as the river. For Texas Holdem, the best hand happens when the player uses his hole cards and the five in the middle. The hand ends in two ways; the first is a showdown where the players turn over their hole cards and the player who has the best hand wins. The second way to end the game occurs when a player makes such a high bet that all the others fold.